Renowned Hotel & Guestrooms. The historic Antrim 1844 is a proud member of Historic Hotels and a recipient of the Certificates of Excellence and Hall of Fame from TripAdvisor. These awards are a reflection of the hotel's upscale accommodations, each room restored with refined and understated class. Many rooms include private Jacuzzis and balconies, gas or wood-burning fireplaces and supported featherbeds overlaid with luxury linens. Venture outside to the property's peaceful gardens, pool, tennis, volleyball and croquet courts for some fun recreation on the grounds. Acclaimed Restaurant. Our Executive Chef, Ilhan Erkek prepares an exquisite menu every evening at the property's luxurious Smokehouse Restaurant. The dishes focus on the finest and freshest ingredients with a sophisticated interpretation of contemporary cuisine that delights the novice epicureans and gourmands alike. The restaurant has received the Best of Award of Excellence by Wine Spectator for over 18 years, Gayot's Top Romantic Baltimore Restaurants, and is part of the Distinguished Inns and Restaurants of North America. Quality Service with a Touch of Class. Antrim 1844 prides itself in exceeding all of our guest's expectations. Special touches elegantly arranged throughout your stay will make your experience that much more special. Enjoy all of our luxurious amenities, such as a traditional English afternoon tea, a wake-up tray delivered to your room each morning with a newspaper and a full country-style breakfast at the mansion each day. Each moment of your day on the property has been carefully and meticulously designed with you in mind. Antrim 1844 takes great pride in delivering exceptional hospitality and turning an ordinary day into a lifetime memory. Extensive Award-Winning Wine Cellar and Spirits Selection. Antrim 1844 boasts one of the largest restaurant wine collections on the East Coast. Sample a glass from the award-winning cellar of over 20,000 bottles representing over 2,700 selections. You can stop by the hotel's Pickwick Pub to enjoy some of the finest scotch, cognacs, bourbons, and whiskeys in the world. Convenient Location. Antrim 1844 is nestled in the quaint, historical town of Taneytown, Maryland and has stood witness to two and a half centuries of American history. Enjoy exploring the surrounding neighborhoods of Gettysburg, Frederick and Hanover or venture out a little further to three nearby major metropolitan areas: Baltimore, MD, Washington, D.C., and Philadelphia, PA.
Electric Vehicle Charging Stations. Antrim 1844 provides a complimentary Tesla connector and a ClipperCreek connector with a universal plug for standard electric cars for our restaurant and overnight guests. Upon arrival, guests are immediately swept away by the elegance of the 17,000-square-foot Mansion. As the towering ivory columns and sweeping grand porches come into view, you will be led through impressive double front doors into the grand entrance hall. Receive your key at our front desk and be whisked up the breathtaking cantilever staircase that spirals gracefully to the top floor. Venture through the hallways to beautiful drawing rooms with 14-foot ceilings accompanied by plaster medallions and crown molding, oversize Monticello windows, interior shutters and marble mantels carved by William Rinehart offset by rich heart pine floors. Through the drawn curtains, look out at the masterfully restored English tea rose gardens and stoically anchored twin fountains. This is the original outbuilding that supported the 19th-century estate. Perishable food was kept cool here in the warm months with large ice blocks placed in the cellar and covered in straw. The cool air circulated upstairs, making it the perfect place for afternoon tea during the summer. An original outbuilding to the property, the Barn is located along the wood-line of the estate which follows a creek running through the property. 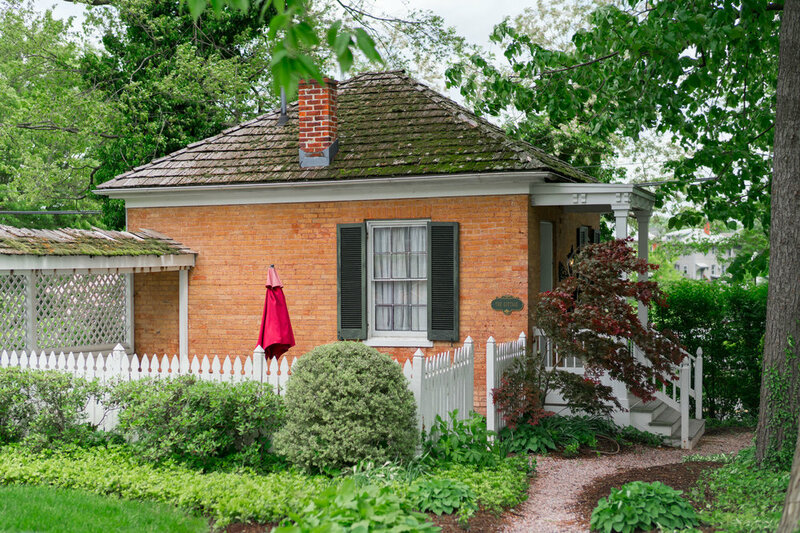 This quaint accommodation was the property's original "Post House" which held all important land deals, tax collections, and business transactions. The cool basement is where horse-drawn carriage drivers often sought rest after a long days work. Named for Mrs. Smith who lived in the house from birth to late in her 90s, she was a local and popular piano teacher. The house was originally built in 1865 and was part of a 100-acre farm located approximately a mile from where Antrim is located. In 1992, after the property was sold for commercial use, the Molletts relocated the house to the estate in an effort to rescue it from being demolished and used it as their residence allowing them to open additional rooms for hotel guests in the mansion. The Smith House was later converted to guestrooms in 1998. This is one of the original Antrim 1844 outbuildings. Carriages were kept on the first floor while stable hands lived on the second floor. 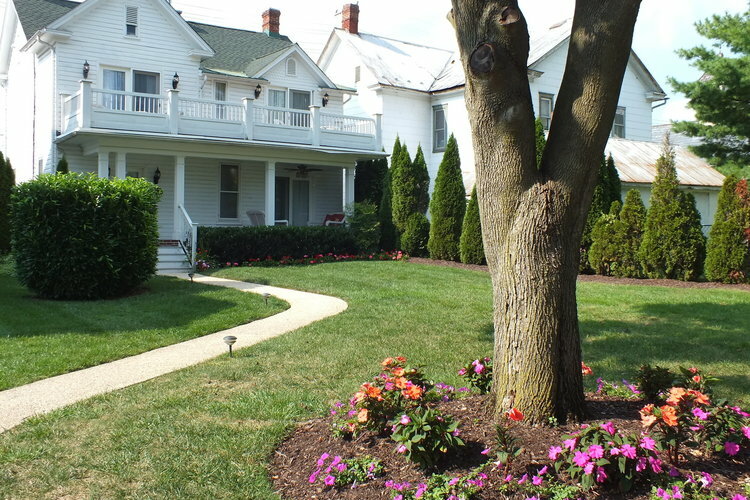 The Carriage House features 2 Suites, 4 Guestrooms and a common area perfect for families or parties to gather. Did you know? Antrim has 11 houses on the property providing 40 unique guestrooms. Accommodations can be made by individual guestroom or for families and groups looking for the rental home feel, reserving all of the rooms within one of our houses provides the perfect getaway experience with luxurious, tailor-made service, spacious common areas, and complete privacy. This location was the original home and office of Dr. Clotworthy Birnie, a prominent Taneytown physician. He served as president of the Medical and Chirurgical Facility of Maryland (now the Maryland State Medical Society) and represented Carroll County in the Maryland House of Delegates. His nieces, Amelia and Elizabeth Annan, resided at the Birnie House. This quaint accommodation used to serve as a utilitarian barn and equipment shed behind the Birnie House. It was converted to a guest suite and named after the Annan sisters, Elizabeth and Amelia, nieces of the Birnies, a prominent Taneytown physician. This house is named in honor of the Witherow family. Harry, Grace, and Lester Witherow sat for a portrait with the famous Zepp Studios in the early 1900s. Wilma Witherow Wood Pocachek, a dear friend of Dort's, was Grace Witherow's niece. Edward P. Zepp was the owner of the famous Zepp Studios where many family portraits of Taneytown residents were taken. Named after Bradford Slonaker who resided here and operated a marble yard on Mill Avenue from 1875 to 1918. Mr. Slonaker made yearly trips to Vermont to select the monument stones to be transported by train to Taneytown. He then engraved the stones himself to transport using a horse-drawn carriage. Did you know? 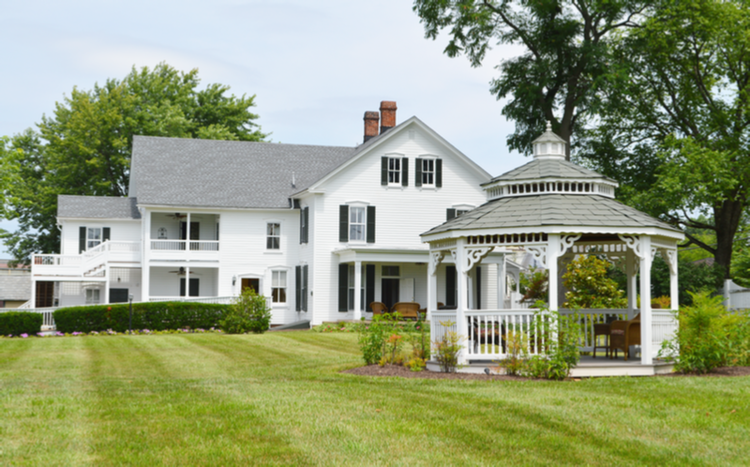 Antrim has 11 houses on the property providing 40 unique guestrooms. Accommodations can be made by individual guestroom or for families and groups looking for the rental home feel, reserving all of the rooms within one of our houses provides the perfect getaway experience with luxurious, tailor-made service, and complete privacy.